RAWALPINDI: A newborn was subjected to rat bites at the Holy Family Hospital. 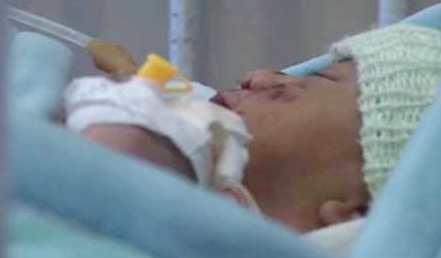 The newborn was just a day old at the time of the rat bites which took place in the Gynecology ward of the hospital. The rat bites are visible on the lips, cheeks, nose and other areas of the newborn’s body. Deputy Medical Superintendent of the hospital, Dr Azhar Farooque said if such an incident had taken place an investigation would be conducted and concerned staff would be questioned. What to say and how to say is the dilemma which I am facing when trying to comment on the news that rats succeeded in biting a newly born baby in Holy Family Hospital, Rawalpindi? Just a little earlier I saw photo of a newly born baby with very much visible rat bite marks on his face which I simply could not have even believed had I not seen the photo and read the news myself. The common impression is that any hospital anywhere is supposed to be much better place than a house so from that point of view something like this cannot even be thought of occurring but very much regretfully it did occur as reported in the daily News. I left Pakistan in 1976 when I was offered an employment to work in an American company in Saudi Arabia and after two years job in Saudia I shifted to Kuwait where I am since 1978 and I very well remember that during those olden days Holy Family Hospital, Rawalpindi used to be one of the leading hospitals of the province and not just the city and as the time passed on it must have grown up in medical attendance. If my information is not rusty, which I rightly believe to be true, HFH was not just a hospital but a teaching one which means it is the place where the medical students are exposed for practical in house training while they are pursuing MBBS course and from that point of view HFH becomes still the more important place for the our future doctors which we badly need in any case. Gynecology or in easy language maternity ward in any hospital is ought to be as extra safe place as an operation theater for that matter simply because here newly born baby is too fragile to resist to any outside influence and therefore it is quite but natural that new born babies are always paid extra attention and care so that the baby does not catch any infection and bacteria etc whatsoever. How could even one think that a rat will not only succeed in entering maternity ward of HFH but also bite the baby and that too for more than once as the wound marks themselves tell the story? I do not have any intention to magnify and multiply the sad incident but the fact remains that when just one rat could inflict such like injuries on the face of the baby so what had been the situation if a group of rats instead had attacked the baby. Each one the rat had inflicted whatever possible and likewise total effect of the entire rate had been disastrous to be honest. The baby face in that sense had been eaten partially by the rats and I have my very serious doubts that the baby face had been restored to normal natural condition even if plastic surgery was conducted on the face of the child. Now when the news is already flashed duly punctuated with the photo there is no room left not to believe what has actually happened but at the same time we must rise to the occasion to meet the challenge of the hour and should not ignore or drop it as such since the task is not over or more correctly it has just started if one truly and rationally realizes. How could as small as a rat which we signify as a sign of cowardice could dodge human beings and pounce on the poor helpless innocent newly born baby is really a very puzzling question? Doesn’t it prove that either the hospital itself or the surrounding area must have been a favorite breeding place for the rats to born and nourished unless we want to put a blame on Taleban to bring the rat and leave it inside Maternity Ward, Holy Family Hospital, Rawalpindi? Didn’t anyone see any time even one rat before in and around the hospital? Did Chief Minister of Punjab Mian Shahbaz Sharif who is also Health Minister and very often calls himself as ‘khadim e Punjab’ must take very serious note of it and ask all the hospitals and clinics of the province to check and report to him directly in 2 days time as to where else rats can be found and what remedial steps they have taken up to stop the menace? This is very serious situation and I am very much awful and afraid that unless and unless thorough investigations are carried out and remedial steps are taken I feel, though do not wish, that it could happen again though not necessarily in the maternity wards but in other wards, hospitals and clinics etc. All those who are found to be negligent must not set free and instead punished severally so that it does not happen again. The world is progressing each and every day if not hour and this undoubtedly happens in the west which is quite but natural but I am not wasting my time to discuss the same and instead will congratulate Pakistan to add additional knowledge to be imparted to our medical students and doctors and I am pretty sure that you have already understood as to what I am hinting to. I am a lay man as far as medicine is concerned but has a feeling that in medical text books there may not be any mention as to what treatment is given when a rat bites simply because the learned thinkers and researchers had never even thought in day dreams that a rat will bite a human. Books are full about the treatment and the medicines to be taken when a dog or cat bites and in the same line students are taught how to treat if per chance a snake bites but if there is no mention about rat bite then it be added not only in Pakistan medical study books but in west also. Thank you rat, you have now opened our eyes and mind to the very novel situation which neither I, nor my whole my present generation had thought of it so you have very rightly added very valuable information to our knowledge. However, at the same time there is a loud message too for you from our side that now we being fully informed and equipped are quite toned up to face the situation if at all you bite again but at the same we Pakistanis feels too ashamed of our selves when you very smartly dodged us and pounced on the newly born baby in Holy Family Hospital, Rawalpindi which we will never ever forget in our lives at least during the present century if not later. Too weak and tiny rat proved cleverer than Pakistanis is the most intriguing part which keeps me wondering how it could happen in a country which is a certified nuclear power on the face of earth. The more I think more ashamed I am of myself to be a national of the country where even as small and feeble like a rat bites human which is a news I never heard in my life even though I am knocking to be 70 just after another 19 days to be precise and honest. How many Pakistanis also felt ashamed like me on rat biting a baby in my beloved Pakistan? Respected Zaidi sahib. I disagree with you for the following. You mentioned that rat bit a newborn baby, I understand that the hospitals needs to be clean enough to free from any insects or rats etc. Who is responsible? Not Khadme Punjab but the Holy family administration. Who is responsible for negligence its the nursing staff because baby must be crying when rat bit him.I witnessed myself that the nursing staff even doctors ignore patients. Its not political but purely administrative issue. Its related to moral degradation of people. The second thing is, it has nothing to do with being nuclear power and being ashamed. I am proud to be Pakistani and will remain because that is the only country which accepts me even if I don't have visa. Try to go to other countries and live and let me know how do you feel? I am neither politician nor supporter of any party, I am just a simple citizen and feel bad if someone like you try to malign my country. I understand there are plenty of problems in Pakistan which needs to be corrected but not everyone is same. There are good people as well.